The oldest of five children (she had one brother and three sisters) born to upper middle class parents; she was baptized on the day of her birth. Her father was Paul Deluil-Martiny, a lawyer, and she was the great-niece of Venerable Anne–Madeleine Rémuzat. Marie received a good early education from Visitation Sisters in her home town, and then the Sisters of the Sacred Heart in Lyons, France. She made her First Communion on 22 December 1853, and received Confirmation on 29 January 1854; Saint Eugène de Mazenod assisted at the Confirmation. At age 15, she and some like-minded school friends started a group and called themselves the Oblates of Mary; while it indicated a devotion, their teachers stopped it immediately as there was a risk of them deviating from orthodox Christianity without proper leadership. Marie began to understand that she had a call to religious life; she starting keeping a spiritual journal, and when she was of age, turned down several marriage proposals. She heard Saint John Marie Vianney preach, and later met with him to discuss her vocation; he encouraged her to follow the call. On 9 March 1864, Marie founded the Guard of Honour of the Sacred Heart, also known as the Association of Presence to the Heart of Jesus, which promoted devotion to the Sacred Heart of Jesus in the Eucharist; it received canonical status on 7 June 1872. In June 1865 as part of her work with the Guard of Honour, she met, befriended and inspired Saint Daniel Comboni in his missionary work; they corresponded for years. In December 1866, while on a spiritual retreat conducted in honour of the beatification of Saint Margaret Mary Alacoque, Marie heard Father Jean Calage preach on the Sacred Heart; she explained her call to religious life to him, and he became her spiritual director. On 20 June 1873, with the help of Father Calage, Marie founded the Congregation of the Daughters of the Heart of Jesus in Berchem, Antwerp, Belgium with a mission to promote devotion the Sacred Heart, and to pray continuously for priests. Their constitution, based on the teachings of Saint Ignatius of Loyola, was completed in 1875, they received diocesan approval on 2 February 1876 from Cardinal Victor-Auguste-Isidor Deschamps, Marie and the first sisters made their vows on 22 August 1878, and Sister Marie served as the group’s superior the rest of her life. They established the first convent on 24 June 1879, received a papal decree of praise on 25 February 1888, was granted full papal approval of Pope Leo XIII on 2 February 1902, and continue their good work today in Belgium, France, Austria, Italy and Croatia. Marie saw few of these successes as she was murdered by Louis Chave, an angry, lazy, down-and-out anarchist whom Marie had hired as gardener at La Servianne in order to give him a chance at a better life. The only child of Joseph Sebastian Brader and Maria Anna Carolina Zahner. Raised in a pious family, she was known as a highly intelligent child, and received the best education her parents could provide. There were high expectations for the girl's future, but instead of continued study she felt a call to the religious life. Mary Josephine joined the Franciscan convent at Maria Hilf, Alstatten 1 October 1880, taking the name Mary Charity of the Love of the Holy Spirit, and making her final vows on 22 August 1882. She was initially assigned as a teacher. When it became possible for cloistered nuns to work as missionaries, Sister Caritas volunteered to be one of the first six sisters to work in Chone, Ecuador in 1888. She worked for five years as a teacher and children's catechist. In 1893 she was transferred to Tùquerres, Colombia where conditions were rough but where she taught the faith to the poor and outcast. To prepare additional missionaries she founded the Congregation of the Franciscan Sisters of Mary Immaculate in Tuquerres, Colombia on 31 March 1893. Initially composes of young Swiss girls with a call to missionary work, they were soon joined by Colombian and other local women. Caritas served as Superior General for the Congregation from 1893 to 1919, and again from 1928 to 1940. The Sisters emphasized good education for themselves and their charges, and deep prayer lives for everyone. They received papal approval in 1933, and today work in Central and South America, Mexico, Switzerland, Mali, Romania and the United States. One of thirteen children. 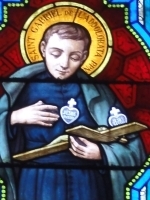 After a youth devoted to the world and society, attending the theatre, chasing women and the hunt, he was led to the Passionist Order by Our Lady, making his profession on 22 September 1857. His life was not marked by great events or controversy, but given to prayer, sacrifice, and a devotion to Our Lady and the contemplation of her sorrows over the suffering of Jesus. Many miracles are attributed to him after his death. Cured Saint Gemma Galgani when she prayed for his intervention. Pope Benedict XV gave him as a pattern for young people. 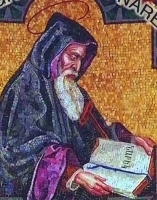 Grigor, the son of Bishop Khosrov Andzevatsi, was descended from a line of scholars and churchmen, and was educated by his father and Anania Vartabed, abbess of Narek monastery. He and both his brothers became monks as young men. Gregory excelled in music, astronomy, geometry, mathematics, literature and theology. He was ordained a priest in 977 in his mid-20's. He lived most of his life in the Narek monastery, where, for his entire adult life, he taught theology in the monastic school. His writings began with a commentary on the Song of Songs, which was commissioned by an Armenian prince, but continued through his life with letters, poems, hymns, music, and essays. Many of his prayers are included in the Divine Liturgy celebrated each Sunday in Armenian Churches around the world, and his masterpiece is considered to be his Book of Lamentations, which has a theme of man's separation from God, and his quest to reunite with Him; it has been translated into at least 30 languages. He is one of the greatest figures of medieval Armenian religious thought and literature, and has been declared a Doctor of the Universal Church. Youngest of six children born to Paulo Cirer and Joan Carbonell, Francinaina grew up in a pious home. She received no formal education, and never learned to read or write. She was Confirmed in 1788 at age 7, made her first Communion in 1791 at age 10. She became a Franciscan Tertiary in 1798 when she was 17. She felt a call to the religious life, but family obligations kept her at home, so she simply helped the poor, taught catechism, visited the sick, and did other works of mercy as a committed lay person. She joined the Brotherhood of the Holy Sacrament in her parish in 1813. People noticed her piety and work, and sought her spiritual advice; she became noted for helping reconcile troubled marriages. On 7 December 1851, with two like-minded local women, she founded the Sisters of Charity of Saint Vincent de Paul of Mallorca, taking the name Francinaina of the Sorrowful Mother of God. Known to receive visions of angels, and was once seen to levitate while in prayer. Joined the Franciscan Capuchins at age 15, and professed his vows on 19 February 1828. Josep was ordained on 24 May 1834 in Barcelona, Spain; two months later, amidst anti-clerical violence in Catalonia, he was exiled from Spain and spent the next nine years ministering in France. He was able to return to Spain in 1843, but the government had outlawed religious orders, and Father Josep spent the rest of his life as a parish priest; he tried always to live his Franciscan ideals. In 1850 he led a group of young women who, on 22 December 1858, would become the Capuchin Sisters of the Mother of the Divine Shepherd, a congregation devoted to pastoral care and teaching young children. Grew up in the area of Sheffield, Yorkshire, England. Studied at Rheims, France, the English College, Valladolid, Spain and the College of Saint Gregory in Seville, Spain from 1592 through 1594. Ordained in 1594. He returned to England to minister to covert Catholics, often hiding under the name William Anderson. Betrayed to the authorities by a friend, he was arrested and condemned to death for the crime of priesthood. He was the final martyr in the persecutions of Queen Elizabeth I; he prayed for her just before he died. One of the earliest martyrs in Gaul (modern France). Her cultus in Normandy goes back to the beginning of the Church, but her Acts have been lost, and no details are known. Educated at Rheims, France and Valladolid, Spain. Ordained in Valladolid c.1597. He returned to England in 1598 to minister to covert Catholics. Jesuit. Friend of Saint Anne Line. 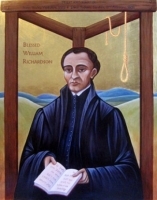 Arrested and condemned for the crime of priesthood. Died with Saint Anne Line and Blessed Mark Barkworth. Martyr. Born to a wealthy family. Studied at the Benedictine monastery of Saint-Mihiel in Metz, France. Reputed to have a prodigious memory, what today was would call “photographic”. Administrator of landed estates. Pilgrim to Rome, Italy. Spent some time at the Monte Cassino Abbey Benedictine monk at Gorze Abbey in 933. Ambassador for Emperor Otto II to the Caliph Abd-er-Rahman of Cordoba, Spain for two years. Abbot at Gorze in 960. Noted as a wise and gentle reformer. Blacksmith and locksmith in Lyon, France known for his personal piety, charity and simple living. Late in life he retired to the monastery of Saint Justus. Ordained as a sub-deacon. Twelfth-century monk at a Greek-rite monastery in southern Calabria, Italy. Around 1130 he lead a dozen monks to the new San Salvatore monastery in Messina on Sicily, finished its construction, served as its first abbot, and made it the mother-house of a number of monasteries throughout Sicily and Calabria. Summoned by authorities to answer a charge of Christianity in the persecutions of Decius, Julian was too crippled with gout to walk there. He was carried to court by two Christian servants, one of whom apostacized; the other was Saint Cronion Eunus. Martyred with Saint Cronion and Saint Besas of Alexandria. Their story is recorded by Saint Dionysius of Alexandria. Mercedarian friar, joining in Paris, France. With the support of the French crown, he was sent to Algiers, Algeria to ransom Christians enslaved by the Moors. He freed prisoners, helped the poor, performed miracles and converted many to Christianity. Soldier. He was on duty when Saint Julian of Alexandria and Saint Cronion Eunus were being led to their deaths. When Besas tried to shield the two from spectator abuse, he was seized by the mob, and killed in the street. His story was recorded by Saint Dionysius of Alexandria. Fifth-century hermit for 60 years, sometimes living with no shelter but a barrel, near a pagan temple outside Gabala (Gala) in modern Syria. He made it a point to speak to the people going to the temple, and converted many of them to Christianity. Opposed the 8th-century iconoclast decrees of Leo the Isaurian, and preserved icons and images in his care. Beaten and imprisoned for this work, he was finally released after Leo's death. Servant of and martyred with Saint Julian the Alexandria in the persecutions of Decius. Born a serf, he worked as a cow-herd near the monastery of Saint Werburgh at Weedon, Northamptonshire, England. Hermit in the forest near Stowe, England. Martyr. Bishop of Cremona, Italy from 1190 to 1195. May have become a Cistercian monk in later life. Monk. 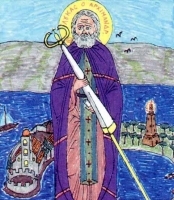 Abbot of the monastery on Mount Jura in the Lugdunese region of Gaul (in modern France). Bishop. Bishop of Lindsey, England. Martyred by Danes. Monk. Abbot in Glenthsen, Ireland.